Did I hear you say you were looking for an eclectic, versatile piece to wear with everything? You found it! 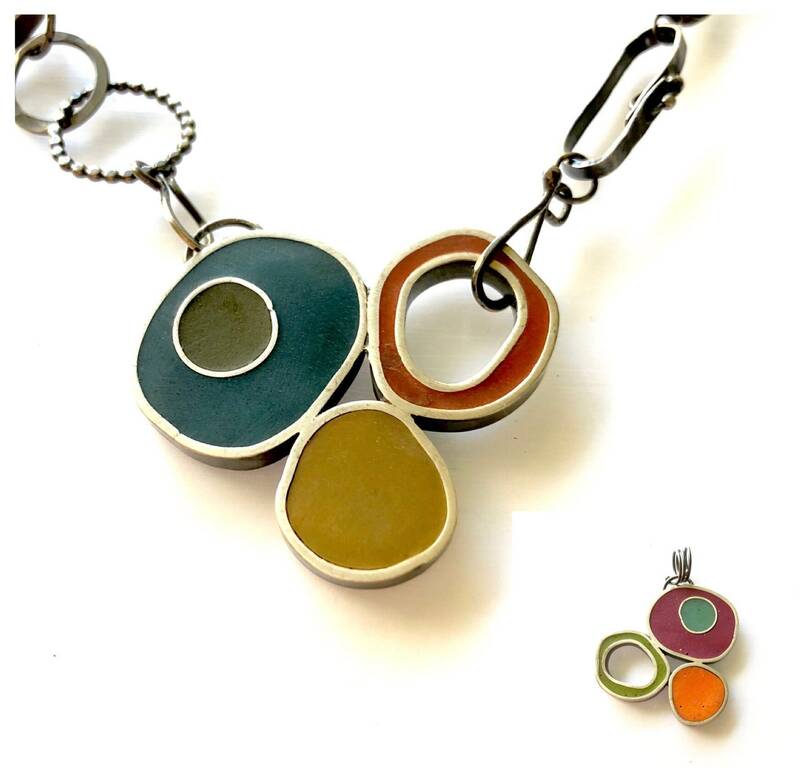 This necklace is comprised of 2 parts-a funky, eclectic handmade chain and a colorful, reversible silver andd resin pendant. The resin is hand-tinted for rich, opaque color and it can be flipped over to reveal a different color set. One side is earthy feeling...blue, green-gold, and dark orange-red; the other side is magenta, bright orange and kiwi green with a touch of aqua. The resin has been sanded to a matte finish. The pendant is attached to the chain with S-hooks, and can be removed if you wish to wear the only the chain (or hand the pendant from a simple chain). The chain is entirely handmade from silver links, a couple of stones, a couple of resin bits, and even an enameled ring. The chain is approximately 17" long if worn alone, or 18.5" if worn with the pendant. It is finished with an oxidized and brushed patina for a rustic look. There is a lobster clasp in back, and 2 hooks in the front (just hook them together if you wish to wear the chain without a pendant...they just blend right into the chain). The length of the chain can be adjusted if you would like a different length. *The photos represent the actual piece you will receive, so take a good look. I'm happy to send additional photos if you'd like a closer look or a different angle. Please keep in mind Baubbly jewelry is intended to be funky and quirky...if it is symmetry and perfection that you seek, this might not be the place for you.